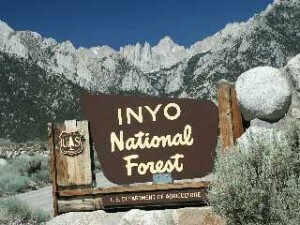 The Inyo County Board of Supervisors hasn’t taken a stand on the new Wilderness Areas proposed in the Inyo National Forest Plan, but they did approve of the process used to arrive at the initial draft. Then, apparently under pressure to add more alternatives with new or expanded areas, the Forest Service came out with Alternative C, adding four new potential Wilderness Areas to the six already designated in the preferred Alternative B, reigniting the debate over how much is too much. That debate started at the Board’s Jan. 19 meeting. While roads into the new areas were cherry stemmed out of Wilderness protection, Off-Highway Vehicle proponents were not happy. In addition to adding the 10-area alternative, there were confusing flaws in the maps and narratives that accompanied the revised plan. County Planning Director Josh Hart prepared a comment letter that reflected the Supervisors frustration and confusion. At both meetings, Fran Hunt, Sierra Club’s representative, explained that Alternative C was just that, an alternative, and perhaps the Board’s frustration was premature. “The agency is required to look at new Wilderness Areas,” she said. “There are four steps. Right now, we’re between step two and three.” Hunt indicated there was plenty of time to reflect what she described as “a negative” approach to the proposed options. While none of Tuesday’s speakers liked the maps or the lack of definitive descriptions of the new areas, all questioned the “hostile” tone of the Board’s comment letter during what is an information gathering phase. It’s never enough. It’s their way or no way. Hard to compete with the big money of the Sierra Club. If the people who advocate access to our public lands had the bankroll of the Sierra Club, we’d be done. Wilderness and open access land for everyone. Bam! A compromise. But, in this day and age, compromise is hard to come by. Big money wins. I’m confused here. The people I know who support the Sierra Club drive worn out Subaru Outbacks worth maybe $900 but with a $1,200 bicycle on the rack. The open access group drive $50,000.00 trucks pulling a $20,000.00 toy hauler gooseneck loaded with $8,500.00 toys. Where is the big money located? I’m not sure if your friends donate some cash to the cause. But as of 2014, the Sierra Club Foundation had assets of 108+ million dollars. Kudos to them. But that’s the Big Money I’m talking about. They are a well organized, wealthy and large organization. With those assets comes a lot of influence and litigation potential. That influence and power, along with the proliferation of Sierra Club sympathizers in the Forest Service, means the local access people don’t have much of a chance. …..and if it weren’t for the Sierra Club and their “cause”,a good chance Inyo and Mono Counties open areas would look like eastside Lancaster and Palmdale,Cal City,Littlerock Dam,or Jawbone Canyon after they “opened-up” those area to “public use (ABUSE)”. Compromise? There is roughly 2.2 billion acres of federal land. The vast majority of which is open for a variety of uses including OHV’s. Designated Wilderness only comprises 100 million of those 2.2 billion acres. Not to mention the hundreds of millions of acres owned by the individual states that is also open to various uses. Compromise is hard to come by? I’m not seeing it that way. I don’t think there is a clear dividing line in deciding when how much is too much when the areas are undeveloped and have no exploitable resources. Of course details are important, so if a road borders an area, and making the area wilderness impacts use or maintenance, borders might need to be adjusted. In the meantime, the forest service looks like it is trying to do its job–which includes correcting the details in what it has done so far, and in looking for more funding sources for the improvement of existing off highway roads. I’d like to see a time when off highway users realize there are benefits to them and the local economy to preserving areas that folks might what to visit. None of these proposals impact the amount of private land in Inyo County, only a small percentage of Inyo Forest.